This web site is optimized under the Firefox navigator. The ABC impacts project is financed by the Belgian Science Policy, research programme "Science for a sustainable development" (SSD), first call. The project has begun on January 2006 and will take place until December 2007. A second phase is expected during the years 2008 and 2009. 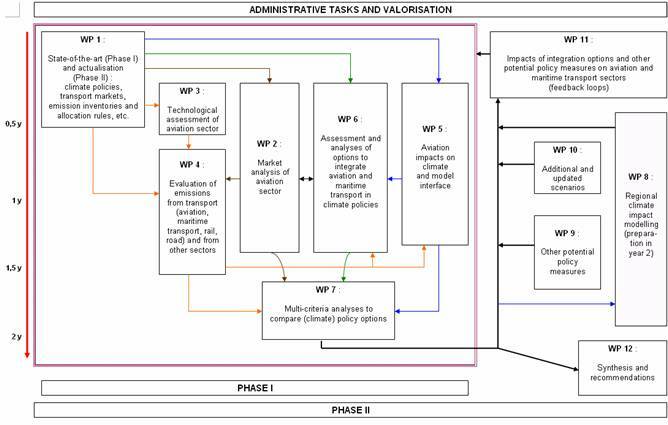 The consortium of research centres that will carry on the work is made of CEESE-ULB (coordination and policy aspects), ETEC-VUB (emissions and technical aspects), MOSI-VUB (market aspects and multicriteria analysis) and ASTR-UCL (climate modelling aspects). A brief description of each research centre is to find on the page About us in the Open section. The website of the project contains this Home page including a summary of the project and a tasks scheme, an Open section with different pieces of information available for anybody and a Secured section used as intranet for the researchers. 01/10/2007 : The JCM5 model (climate modelling) with its new module on aviation is available on the page Calculate your own impacts. This module gives an overview of the influence of the aviation sector on climate according to several parameters (you may change these parameters and see the modifications that changes have generated). Its is the first step towards the development of an interactive tool to assess impacts of specific flights. 14/08/2007 : The page In Brief in the 0pen Section has been completed with a glossary of the main specific terms used in the context of the ABC Impacts project, and different synthesis documents on "Climate stake and climate policy : mitigation and adaptation", "Belgian institutions related to climate policy", "Aircraft emissions" and "Climate impacts from the aviation". The ABC impacts project aims at providing Belgian stakeholders with a detailed and integrated analysis of issues related to the inclusion of international air and maritime transport into European and/or international climate policy. The Intergovernmental Panel on Climate Change special report on aviation (1999) has revealed the importance of the impacts on global warming of emissions from the aviation sector. Such report indeed shows that, in addition to CO2, condensation trails, NOx emissions and cirrus cloud formation have a significant impact on climate change. Yet, emissions from international air and maritime transport are not targeted by the Kyoto Protocol commitments, and are not integrated in any international climate policy, despite considerable growth in these sectors in the past several years. Nevertheless, the possibility of integrating these sectors is more and more considered both at the European level and in the context of the United Nations Framework Convention on Climate Change (UNFCCC). The European Union is planning on including aviation in its emission trading system starting in 2013, and it is very likely that part of the post-Kyoto international negotiations be dedicated to accounting for emissions from international transport. Different options may thus be considered for the inclusion of international air and maritime transport into climate policy, and the analysis of such options is of particular interest for Belgium, given the importance of these sectors in its economy. In this context, the ABC policy project will provide in two successive phases a new, in-depth analysis of the aviation sector and climate policy options from a technical, environmental and an economic viewpoint, compared to other international transport modes. A multi-criteria analysis aimed at comparing various political options with respect to the priorities of civil society (WP7). The updating of major parameters (for instance: fuel prices and the demand for international transport), the development of potential evolution scenarios for aviation and maritime transport (WP10) and an assessment of major implications for Belgium, the aviation and maritime transport sectors based on the policy options and scenario chosen (WP11). The project will deliver, towards the end of its second phase, a synthesis report that will compare, from a political, technical, socio-economic and environmental viewpoint, the options for integrating air and maritime transport into climate policy. Finally, it will provide a series of recommendations for Belgian decision-makers, based on the multi-criteria analysis (WP12).